It’s never ideal when your smartphone or tablet is caught short and unexpectedly runs out of battery whilst travelling. In the vast majority of cases, there’s a plug socket not too far away and life goes on. 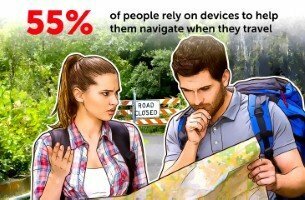 However, research from Kaspersky Lab has highlighted just how reliant we’ve become on our devices out on the road. The cyber security firm reckons that connected devices are now a holiday essential, with people relying on them find their way from A to B (55 per cent), or call for help if needed (51 per cent). In fact, people are so dependent on their devices that 39 per cent can’t even imagine travelling anywhere without them. As such, when devices start malfunctioning or their connection gets lost, people very quickly feel vulnerable with one in six (17 per cent) having had travel issues as a consequence of losing connectivity. Most respondents (84 per cent) agreed they would feel stressed if they were lost in an unknown place, while almost two in five (39 per cent) worried about something like this happening to them. Kaspersky Lab’s study also uncovered various horror stories of people not being able to find somewhere to stay, to missing a call about a flight change, or ending up with food poisoning after not being able to look up information online about where to eat. One extreme example even resulted with one respondent getting stranded in a desert when their smartphone suddenly died. With a fully working phone, the situation would’ve been quickly resolved but as it was, they were left in danger. David Emm, principal security researcher at Kaspersky Lab, said: “In an age where we need to be connected in order to go about our day-to-day activities, we need to be more careful with our phones and tablets to avoid being stuck without our beloved devices.